Time for you to stop struggling and start succeeding! Give your career the power boost it needs by choosing the perfect-for-you pre-licensing course . Need flexible scheduling? Attend our ONLINE class! A pre-licensing course is a mandatory requirement for all aspiring real estate sales agents. You need to take THREE 45-hour courses, approved by the California Department of Real Estate. You need to pass the State Exam with a whopping 70%. That, in itself, is a Goliath-esque challenge. Add to this the fact you may have to balance studying with your day job and family commitments… and you can almost start to feel the overwhelm choke up your insides. But then… you think about how much being a real estate sales agent means to you. After all, a career in real estate is a life-changing one. Choosing a pre-licensing course is as tough (or maybe, tougher!) as choosing a college. After all, you’re placing your career in the hands of an institute. How do you know you’re making the right choice for your pre-licensing course? You choose a course that gives you not just the most updated (and interactive!) material but also consistent, unwavering support, access to a student community AND a solid wall of proof. You choose a course that builds your confidence while reducing overwhelm, one lesson at a time. You choose a course that’s created by seasoned instructors who are right there in the trenches with you. Affinity’s widely trusted pre-licensing courses are for serious professionals. Real Estate Principles: This mandatory course covers must-know real estate principles including legal descriptions, methods of acquiring title, deeds, estates, liens, homesteads, and the programs involving lenders, escrow, and title companies. Real Estate Practices: Another core or mandatory course is a broad collection of real estate practices a real estate salesperson will likely encounter in their first four years of practice. Real Estate Finance: This is the elective option Affinity offers. It is a modern approach to real estate financing and includes money and interest rates, sources of mortgage money, non-institutional leaders, conventional loans, government-backed programs, foreclosure and other loan problems, construction lending, and alternative financing methods. Don’t have time to travel? Can’t take days off from work? We got you covered with the ONLINE Pre-Licensing Course for California salespersons. You can take the same course from the comfort of your home and get your California real estate salesperson license without spending hours commuting to class or taking time off from work. You get INSTANT access to the course material. PLUS… Your online course comes with in-built quizzes AND a FINAL exam so you can get your Certificate of Completion to send to the California Department of Real Estate with your exam/license application. Don’t worry! These online video classes are just as entertaining, engaging and educational as attending a LIVE class. In addition, you get access to your instructors via a private Facebook community so you can ask questions and clear your doubts without Googling yourself crazy! If you’re serious about getting your California Real Estate Salesperson License THIS year, we strongly suggest you reserve your seat TODAY. You have decisions to make. Chances are you’ve got a bunch of tabs open in your Chrome browser as you research the different real estate training schools. Let’s make this easy for you. ► Engaging, interactive content that doesn’t bring on a snoozefest. ► Access to lead instructors so you don’t have to rely on Google or random forums for advice and inputs. ► The most updated and confusion-free material that doesn’t compromise on quality. ► Access to a student community so you can brainstorm, swipe best practices and learn from other professionals. ► You must be honest and truthful. ► You must complete college level courses on Real Estate Practices, Real Estate Principles, and one elective. At Affinity, we offer Real Estate Finance as an elective. ► You have ONE year to complete your ONLINE course from the time of enrollment. ► For the LIVE course, you can take an online exam OR book a date and come to our Bellflower office for an open book exam. ► You must pass the State Exam that includes 150 questions with a grade of at least 70%. “Thank you Artricia Woods. After taking the exam twice and failing with previous schools, I only had one more shot before having to wait 6 months. 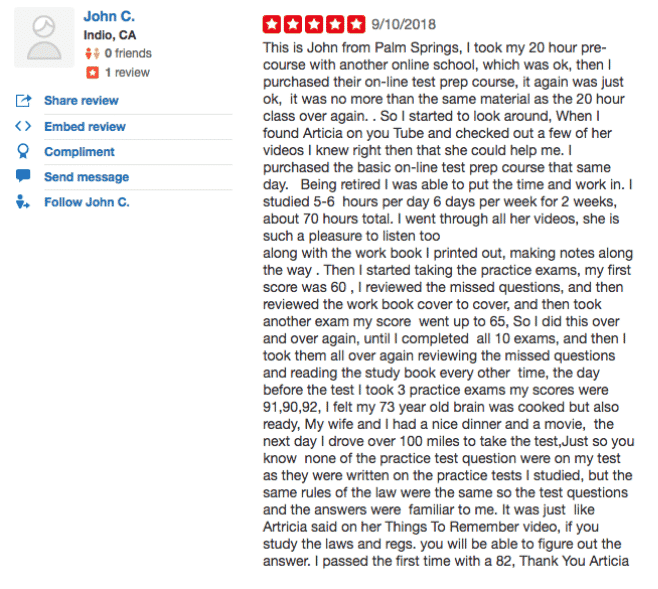 “Took a 20 hour class online for my MLO license and failed miserably. Found the live crash course that Artricia Woods teaches and it saved me. Taught in way that makes it easy to remember and learn key terms and laws. “So excited to share with everyone that I passed! I joined the crash course one week before my Exam, Artricia refreshed all the important material that helped us to remember… you MUST join the crash course, it’s really helpful! 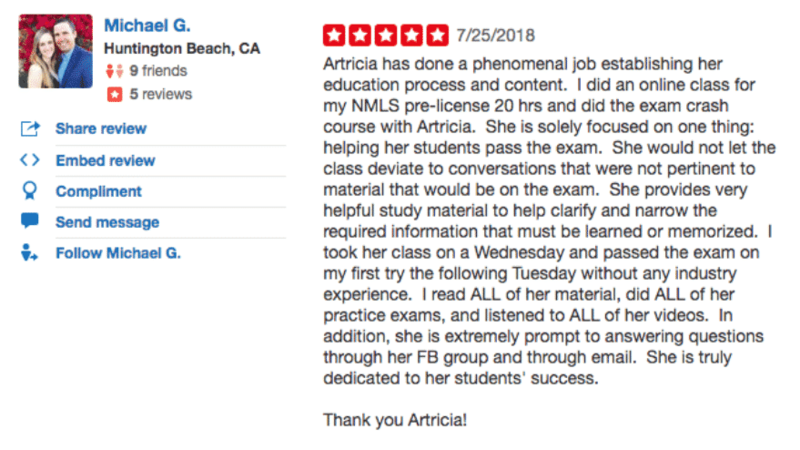 If you’re looking for a “complete” real estate education provider who will be there every step of the way, look no further! Now is the time to prepare for your California Real Estate Salesperson License. Complete just 3 required courses in as little as 7½ weeks, attend a State License Prep Course, then take the State Exam. What if I decide to cancel my enrolment? A refund may be requested 48 hours prior to the start of any course. Refunds will not be made if the course started or has already been completed. A $25 restocking/administrative fee per course will be retained by AFFINITY. What if I can't complete the course and need to extend my enrolment? You have one free reschedule and the cost per additional reschedule is $25/each. Course change or rescheduling is based upon availability and must occur within six (6) months of the original purchase date or registration registration date. Should I also take a Prep Crash Course for the CalDRE exam? While a Prep crash course is not mandatory, we highly recommend taking it to strengthen your mastery of real estate concepts, principles and practices. Again, we offer BOTH online AND live options for you to choose from. Check out the info page here. Sure thing! Please email us at info@affinityreservices.com or call at 800-991-6097 Ext 2 and we’ll be happy to help answer any questions. “Thanks to Artricia and her crash course with Affinity Mortgage I passed my mortgage licensing test on my first try! I used a different company for my 20 hour course but still didn’t understand anything. “Thank you Artricia! 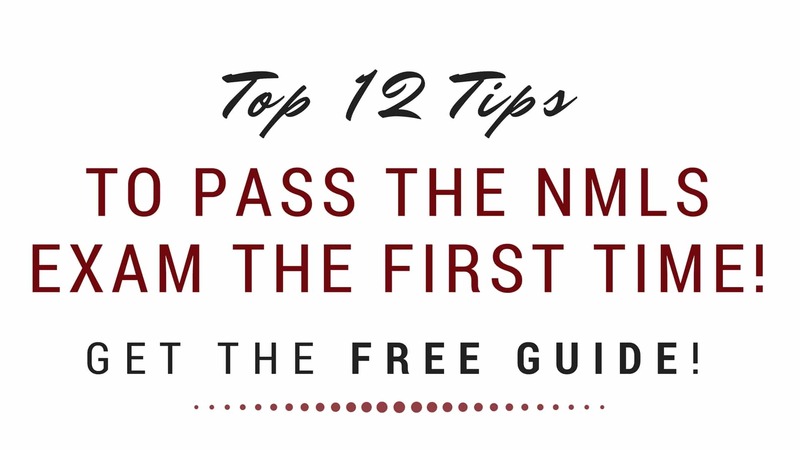 I followed your steps and studied all the material you sent me after completing your NMLS Crash Course and I just passed my test today on my first attempt with 90%!